I'm heading off to the home of golf and while I would love to say I've read all of the U.S. Women's Open preview stories, I have not. But as I note in this week's Forward Press, the course should provide an entertaining setting and due to unforeseen circumstances, will get some of its best visibility ever thanks to no competing PGA Tour or European Tour event and a west coast, prime time finish. But Ron Sirak's GolfDigest.com piece on Michelle Wie, winner at Pinehurst just two years ago is worth checking out. But she is now winless in 50 LPGA starts since Pinehurst with 14 missed cuts and five WDs. One explanation for Wie’s inconsistency can be found in her health, where she’s had extremely bad luck. She’s had problems with her wrist, her back, her hips and her ankles. She also has multiple food allergies, which has complicated matters. Wie remains a huge fan-favorite and is probably the woman who has moved the needle the most for women’s golf since Nancy Lopez almost 40 years ago. A winning Wie is good for golf. Follow Ron for updates from the women's U.S. Open. This is the 71st U.S. Women’s Open Championship. The first U.S. Women’s Open, played at Spokane (Wash.) Country Club in 1946, was the only one conducted at match play. The Women’s Professional Golfers Association (WPGA) conducted the inaugural championship, won by Patty Berg. The WPGA conducted the Women’s Open until 1949, when the newly formed Ladies Professional Golf Association (LPGA) took over operation of the championship. The LPGA ran the Women’s Open for four years but in 1953 asked the United States Golf Association to conduct the championship, which it has done ever since. The youngest winner of the U.S. Women’s Open is Inbee Park, who won the 2008 championship at the age of 19 years, 11 months and 18 days. Babe Zaharias, who won the 1954 Women’s Open at age 43 years and 6 months, is the oldest winner. In 1967, Catherine Lacoste, daughter of French tennis player Rene Lacoste and 1927 British Ladies Amateur champion Simone Thion de la Chaume, became the only amateur to win the U.S. Women’s Open. Six other amateurs, most recently Brittany Lang and Morgan Pressel in 2005, have had runner-up or co-runner-up finishes. Se Ri Pak, of the Republic of Korea, received a special exemption into the 2016 U.S. Women’s Open. In March, Pak, 38, announced her intention to retire following the 2016 professional season. She plans to return to Korea and serve as an ambassador for the game of golf. Pak’s 1998 U.S. Women’s Open victory at Blackwolf Run in Kohler, Wis., revolutionized women’s golf and sparked a cultural phenomenon. When Pak won the 1998 U.S. Women’s Open, she was the only Korean player on the LPGA Tour. Since then, countrywomen Birdie Kim (2005), Inbee Park (2008, 2013), Eun-Hee Ji (2009), So Yeon Ryu (2011), Na Yeon Choi (2012) and In Gee Chun (2015) have joined Pak as U.S. Women’s Open champions and more than two dozen players from Korea compete regularly on the LPGA Tour. The USGA accepted 1,855 entries for the 71st U.S. Women’s Open. This marks the second consecutive year the U.S. Women’s Open has received more than 1,800 entries. The 2015 championship at Lancaster (Pa.) Country Club holds the entry record with 1,873. The 156-player field includes 93 fully exempt golfers and nine past Women’s Open champions. Sectional qualifying, conducted over 36 holes, was held at 25 sites between May 9 and June 3, four international (China, England, Japan, Korea) and 21 in the United States. Scott Lipsky leads off some U.S. Senior Open notes with an item on Doug Williams, making his Senior Open debut and who, at 43, faced an 11-year-old Michelle Wie in the Hawaii State Amateur Match Play Championship. Wie tees off Thursday at Royal Birkdale in the Ricoh Women's British Open as the reigning U.S. Women's Open champ. Q. You said we could ask you anything, and I notice sitting here in the front row that you have different nail polish on your fingers. Is that to help you with your grip or is there a reason for that? Q. Just your whim this morning? Q. And was that your Pomeranian I saw up on the hospitality deck there yesterday? Did you bring, is it Lola, your little doggie? 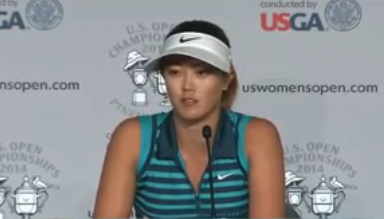 MICHELLE WIE: I don't know, was she out there? Yeah, I guess so. Maybe. It's not often you get two rally killers of that quality in one session! History was made at Pinehurst today! If you don't believe this occurred, the video of Wie's press conference can be viewed here at GolfChannel.com. Annika On Wie: "Now she’s one out of many." Storyline Pairing? Lydia Ko & Michelle Wie?! Fred Woodcock reports on the Kraft Nabisco Championship opening 36-hole pairing of 15-year-old phenom Lydia Ko and former 15-year-old phenom Michelle Wie, not a 23-year-old strugging to find her game as the LPGA's first major kicks off in Rancho Mirage. The two have played together but it still begs the question, is someone sending a message? "The Education Of Michelle Wie"
Inbee Park tees off at Industry Hills' 10th Sunday (click to enlarge)While it was tough to tear myself away from the Arnold Palmer Invitational at Bay Hill, Steve Elling's story on the silly setup assured me I missed not a thing. Instead I headed out to the City of Industry where, despite playing the inhumane and walking-impossible Industry Hills composite layout, the atmosphere was celebratory and the golf rewarding to watch. "Are you a Phi Beta Kappa yet?" "If Wie was lying, she’d be the one to have to look in the mirror when she puts on her makeup and know she did." Thanks to reader Tom for John Vander Borght's follow up to his original post on Michelle Wie and her questionable explanation for grounding her club, which he's apparently caught a little flak for defending. I think he makes a fair rebuttal point even though I find her explanation dubious. Thanks to Twitter I was able to catch the bizarre scene when Michelle Wie was in the TV truck discussing a ruling that cost her two shots and solo second at La Costa, five shots behind winner Hee Kyung Seo. "Wie, meanwhile, might have the best of two worlds." "What happens in Mexico stays in Mexico." Wie started the fall semester in college, had barely practiced or played, and hadn't entered an LPGA event in five weeks. Wie said she was so distracted by the ankle that it probably helped her from getting caught up in the pressure of the moment. "Walking a golf course is a long walk," she said. "The people at the LPGA have been working on my ankle a lot, icing it, and maybe it's another reason why I was able to keep calm because all I was focusing on was finishing the round. I was just focusing on my steps and not hurting." Baby steps, if you will. Q: After clinching the win, you had beer poured on you by the other players on the 18th green. Q: You're not 21 yet. Are you going to get in trouble with the LPGA? A: No, what happens in Mexico stays in Mexico. It was just really cool. You see it on TV; whenever somebody wins, players pour beer all over them. It was one of those things where I always wanted that to happen. Great to see Michelle Wie overcome all of the folks hoping to see her fail--if you read the Huffington Post--and win an LPGA Tour event. Ron Sirak reflects on what a "long, strange trip" it's been for Wie. "The golf establishment, especially in the United States, is full of venal, haunted little men--players, executives, sportswriters, broadcasters"
..is it a coincidence that Michelle Wie is playing so well and exuding incredible confidence, composure, passion and determination the week her parents are kept just a Wie bit more distant than normal?